Responding to concerns about the overall cost of attending our 50th reunion, the Reunion committee has decided on Las Vegas – economical travel from Hawaii and mainland locations, many lodging options, and a wide range of entertainment opportunities. In an effort to reduce reunion costs and make it possible for more to attend, we are going to try with your help to do as much fund-raising as possible in advance. Although final confirmation of exact reunion dates and venues cannot be confirmed until contract signings in late 2019, your committee has tentatively selected OCTOBER 2020 for our Beeg 2020 reunion. Please SAVE this month. Primary venues will be California Hotel Ohana Room (Banquet), Main Street Casino Garden Court Buffet (Aloha Breakfast), and Aloha Kitchen/Jackpot Grill & Bar (Aloha Night Karaoke). It’s very important that attendees commit as early as possible so that the committee will have a reliable head count for rooms and meals. We will REMIND you, no worry! Dina is working hard with hotel staff to block rooms at the California Hotel at a special discount rate. However, classmates are free to make their own lodging arrangements. Open “mike” event and special video created by Mark Barnett. Runi will create and present a small Island entertainment package. Remembrance Video, incorporating still photos and video clips. PLEASE KOKUA. Your committee is determined to create a low-cost event that will draw the maximum number of attendees. Donations and fund-raising will reduce banquet fees and provide money for deposits and other pre-Reunion costs. All Rams are encouraged to donate on our webpage https://www.payit2.com/e/radford-class-of-1970-donation. While any amount is welcome, donations in the below range will receive special acknowledgement by name or, if desired, anonymously, in the Banquet program. The link will also be posted on our group Facebook page and on the Donation page on this website. Alternatively, donors may wish to make a “named” contribution of $25 in honor of a particular teacher or classmate. These sentiments will be placed in the Banquet program. Donors contributing $150+ will be entered into a drawing for a beautiful origami swan – created by our own Dina. Our first fund-raiser starts right away!! Need a gift for friends and family? Our Island Gift Pack of your favorite Hawaiian snacks is the PERFECT Christmas gift! Or, if you're just craving for them, why not just get some for yourself! To order, go to our fundraiser webpage https://www.payit2.com/e/rhs70-fundraiser. The link will also be posted on our group Facebook page and on the Fundraser page on this website. Our second fund-raiser begins in Spring 2019 with the sale of Way Cool Class of ‘70 T-shirts. Stay tuned for details. Also, we need a unique reunion LOGO!! The logo will be used to publicize 2020 reunion events and printed on a limited number of T-shirts. Please put your creative juices to work. Work up a design and send it to the committee at1970.radford.hi@gmail.com. The best submission will earn the designer a $50 gift card and special recognition at the banquet!! We’ll be sending you more information about this, too, specifications, deadlines, etc. – but it’s not too early to start thinking. What else can YOU do now?? Start gathering emails and other contact info for our classmates. We have a lot of “missing” Class of ’70 Rams. There are plenty of folks who have yet to attend a reunion. Help us find them. Forward this info to Dina at 1970.radford.hi@gmail.com. Better yet, reach out yourself and tell them to register and SHOW UP in Las Vegas. And, of course, we welcome and invite the attendance of members of other Radford classes who want to join in our 50th festivities. Bring your spouses, Significant Others, and friends. RHS platform to receive our diplomas? YES! Birthday shout-out to everyone celebrating their birthday in April!! Wishing all of you a very Happy and Blessed Birthday and many, many, more!! Also wishing a Happy Birthday to those that we do not have birthday information on!! The Class of 1970 Ohana sends their heartfelt condolences and prayers to the family of our dear friends and classmates, Aaron Takeuchi, Landra F. (Jones) Thomas, and Ron Harbison. 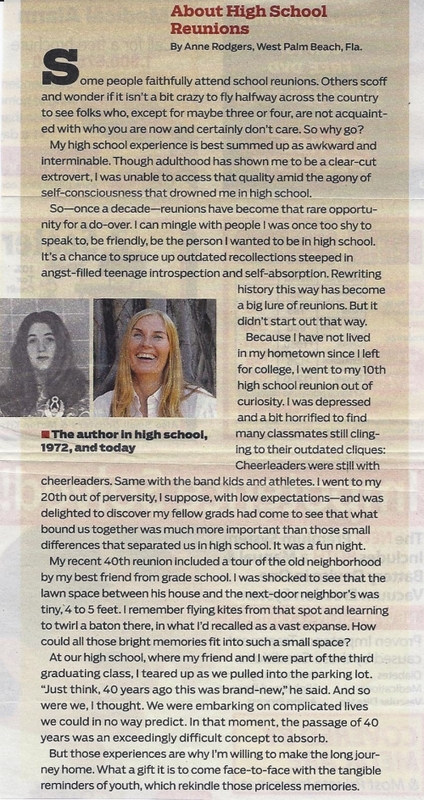 Something to read and ponder…..
Why Attend a Class Reunion? I went to a committee meeting at Candy’s the other night. We are having committee meetings every few months now in preparation for our 45th high school class reunion this coming August. There were six of us there, Barb, Becky, Candy, Cheryl, Kay and me (our only male committee member, Jerry, was out of town — the one who is so good at reminding us we’re getting off track). Barb, Becky and Cheryl are the relatively “new blood” that is much needed for a committee that has been meeting every five years forever. The hotel is booked and the program and menu will be planned closer to the time. But there are always two items that we have to work on now: finding addresses and/or e-mails in order to contact classmates, and, once we’re in contact with them, convincing more of them to attend! I am always amazed at the number of classmates who even still live in this area, but never attend the reunions. don’t think they will have a good time. It’s the last two that I wish we could somehow convince them are non-issues. Regarding number two: Hello? It’s been forty-five years! Who the heck remembers everyone they were friends with in high school? At this point, you are getting together with people who have common memories of your teenage years. There is something so fun about sharing memories of a favorite teacher or a memorable hang-out, even with someone who you didn’t know very well then. (And, since most of us have really bad memories by now, we’ll be able to compare the same memories at our next reunion in five years, and neither one of us will remember, so it will be like a new conversation! And, number three. At 63 years old — we are all waaaayyyy past caring about that “looks” and “career” stuff. Yes, there are some who are more “well-preserved” than others, but there are many more of us who just look like what we are … people in their sixties! And, you know, at this age, everyone is friendly and glad to see everyone else, and there’s hardly any talk about “careers” because most of us don’t have one any more! So, if you smile and look like you’d like to have a conversation, someone will feel “invited” by that smile, and strike up a conversation with you. I’d bet on it. So, now dear readers, here’s my request of you. Becky, one of the “rookies” who has really taken to this reunion stuff, suggested that in our initial mailing, we have a fun list of “Top Five Reasons You Should Attend the Reunion.” I think that’s a great idea and I know there must be some terribly clever things we could put on that list, I just can’t think of them. So, how about helping me look “brilliant” to my fellow committee members for our next meeting, by giving me any ideas you have for reasons we could put on that list? I’m looking forward to seeing what ideas you might have. Here are some reasons we could put on that list! 10. To remember when Madonna was still a virgin. 8. To remember when MTV actually played music. 7. To find out "Where's the Beef"? 5. To remember when Prince was Prince. 3. To remember special moments at our favorite H/S hangout. 2. To remember the days when people didn't pay to get a tan. you'll be missed if you don't show up). event that they wouldn't have missed!!! The professor then picked up a box of pebbles and poured them into the jar. He shook the jar lightly. The pebbles rolled into the open area between the golf balls. He then asked the students again if the jar was full. They agreed it was. The professor then produced two beers from under the table and poured the contents into the jar effectively filling the empty space between the sand. The students laughed. The sand is everything else--the small stuff. If you put the sand into the jar first," he continued, "there is no room for the pebbles or the golf balls. The same goes for life. If you spent all your time and energy on the small stuff you will never have room for the things that are important to you. Pay attention to the things that are critical for your happiness. Spend time with your children. Spend time with your parents. Visit with grandparents. Take time to get medical checkups. Take your spouse out to dinner. Play another 18. There will always be time to clean the house and fix the disposal. Take care of the golf balls first--the things that really matter. Set your priorities. The rest is just sand." There are 104 Alumni that have added their profile. There are many classmates who are not into the 'social media' stuff as well as classmates who are unable to attend class reunions or other class get-togethers, so it is this website that they stop by to visit and to catch up. It would not only be wonderful, but ever so meaningful and heartfelt if more of you would register and add your profile to the '1970 Alumni Profile' page. The quest to locate as many classmates, if not all, continues! 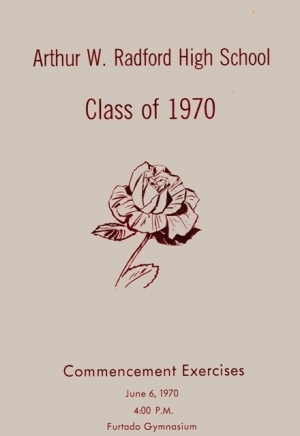 Although the Commencement Program lists 483 graduating seniors, many students left before graduation due to their parents' military reassignment, or because their families relocated out of district. If you are in contact with a classmate that is listed as missing on the 'Missing Alumni' page, or any classmate who attended Radford that would have graduated in 1970, please send us their contact information or send them a message to let them know that we are here. So that we may remember those who we've lost, if you have information to share, please go to the "Contact Us" page and use the form to send an email. Please include as much details as you can when sending in the information. This site is hosted by Myevent.com. This is an “All Volunteer Effort” paid for by personal funds and is not supported by donations from Radford High School, Class of 1970 Classmates, or Sponsors. If you would like this website to continue, please go to the "Contact Us" page and use the form to send an email to request for the mailing address to send in your donation. Your support to help keep this website active would really be appreciated. Mahalo! We respect your privacy! Personal information that you enter or send will not be sold, shared, swapped, or otherwise disclosed. Contact information will only be used to send out e-Blasts for class related purposes. If at anytime you would like your personal information or contact information be removed from the class database, please use the form on the 'Contact Us' page to send an email to the Website Administrator.